(French) You’ve not heard of the Bosvin-Michel-Spéciale? You are forgiven. The Bosvin-Michel-Spéciale (BMS) is a very successful example of that rare breed of French etceterinis but is not widely known today. These French etceterinis are mainly grouped into two main categories: the Panhard-based (using at least Panhard motors) and the Renault 4CV-based cars. The BMS is part of the latter group. In La 4CV Bosvin-Michel-Spéciale, Robert Bosvin has recounted in this slim book the story of his late father Camille Bosvin, who, like many others, started to build specials after World War Two. But he did far more than just use the “hot” 4CV 1063 (the tuned race special the factory made) as a basis. Bosvin went all the way and built his own space-framed cars with mid-mounted engine, turned around by 180° so you have the classic engine, gearbox, differential arrangement. He even did scientific studies and calculations on aerodynamics during the evolution of the cars (some examples are shown in the book). Therefore the BMS was very advanced for its time. 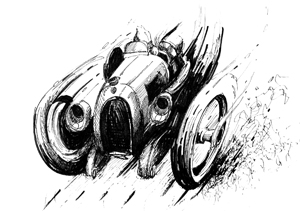 Guy Michel, a friend of Camille Bosvin, owned the cars and raced them very successfully, leaving the role of constructor and mechanic to Camille. They built one or two cars, which were modified from year to year. At first they called them “tanks,” then “barquettes” and much later the bodywork was finally constructed by Chappe et Gessalin, who later produced some of their own CG-cars (of course there is a book on CG too!). BMS didn’t just enter local French events—far from it. The Rally Monte Carlo, races at Monthlèry, the Mille Miglia, the Bol d’Or, the Tour de France and of course the 24 Hours of Le Mans. They achieved good results in their class (the famous French 750cc class that later was also the playground of Colin Chapman’s Lotus.) Being a 100% private constructor, their success was significant, often placing right behind the D.B. (works) cars. Robert Bosvin tells us the story of his father’s constructions with wonderful period pictures and we also get the whole racing story with evocative pictures and some race results. The whole little book comes alive due to the Bosvin family’s archive pictures. 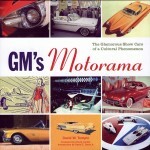 If that theme wetted your appetite for obscure French cars, here is another book, also from the French publisher Pixel Press Studio’s “Mémoires Automobiles” series, which is an imprint of Boutique Gazoline magazine that is also the French distributor for these and many other such gems. La Saga sportive de la Renault 4CV by François Rivage presents exhaustive information on the 4CV 1063 (the race special) with the development, the works-entered cars, race results, and hundreds of race photographs. The works entries constitute only one part of the book. As with the BMS above, there are many, many other specials, here all based on the Renault 4CV and they are all presented here, not only the obscure one-offs but also the beginnings of the Rédélé cars which later became the famous Alpine. There are no special chapters for these cars in the book, but they are shown and mentioned where they have been raced or participated. Hundreds of photos accompany the text. Last but not least, there is the book Sportives tricolores, 1950–70 by Jean Paul Decker. This is a glossy overview, not going extremely deep, but presenting lots of information on specials including those based on Panhard and Renault. Furthermore there are other small makers discussed such as JIDE, Matra, D-B, Alpine, and Ligier. This book complements the others very well, and gives a good insight into the French etceterinis which were nearly as diverse as the Italian ones. Decker is a journalist and automobile historian with a number of vintage- and classic-car publications to his name.